The Cisco Catalyst 2960-S switches are the leading Layer 2 edge, providing improved ease of use, highly secure business operations, improved sustainability, and a borderless network experience. The Catalyst 2960-S series switches include FlexStack switch stacking capability with 1 and 10 gigabit connectivity, and Power over Ethernet Plus (PoE+). 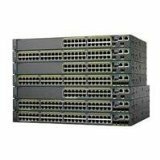 The Cisco Catalyst 2960-S switches are fixed-configuration access switches designed for enterprise, midmarket, and branch office networks to provide lower total cost of ownership. FlexStack technology, which simplifies operations, enabling a stack to be configured and managed as a single switch with 20 Gbps of stacking throughput.